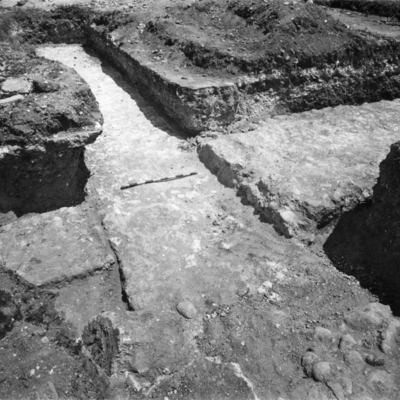 Coverage is exactly "Bath D"
Large water pipe and drain beside it. 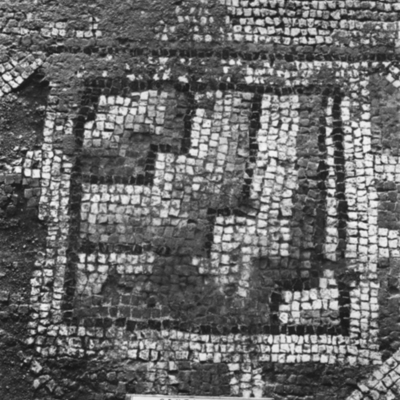 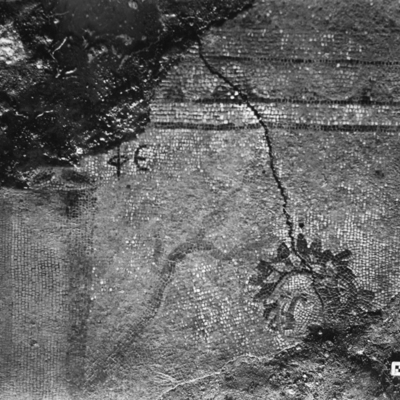 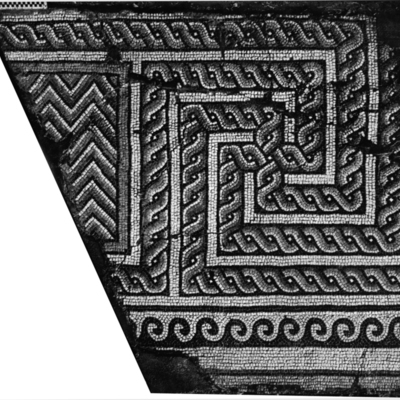 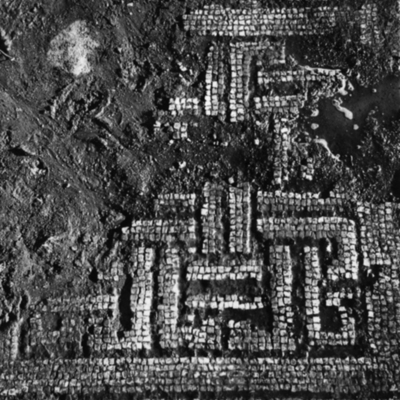 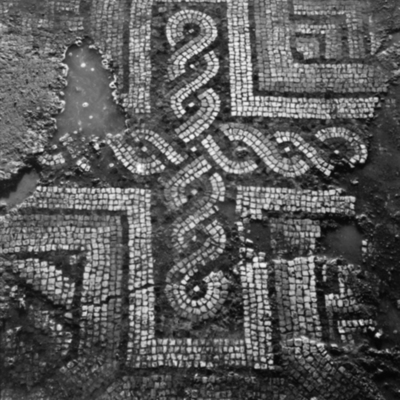 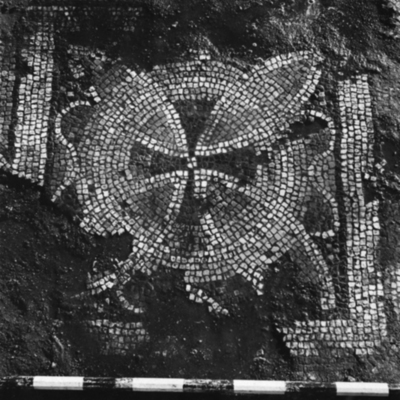 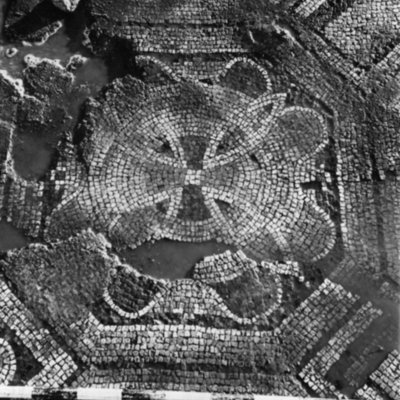 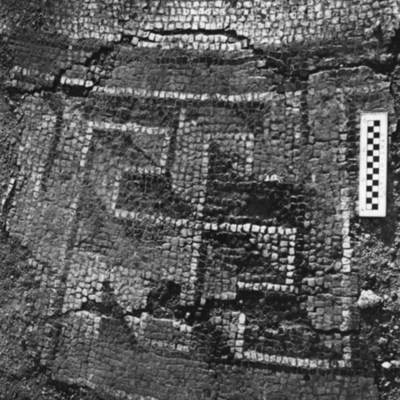 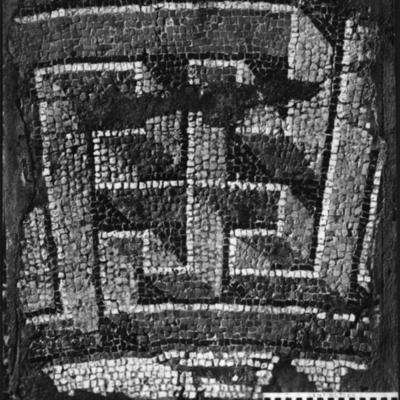 Section of suspensura showing method of laying mosaic. 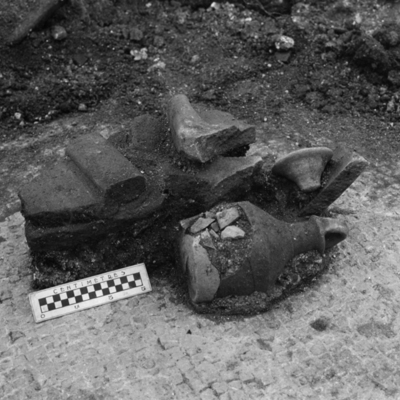 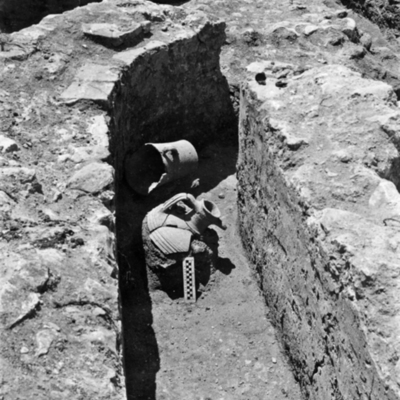 Detail of walls and amphora in situ. 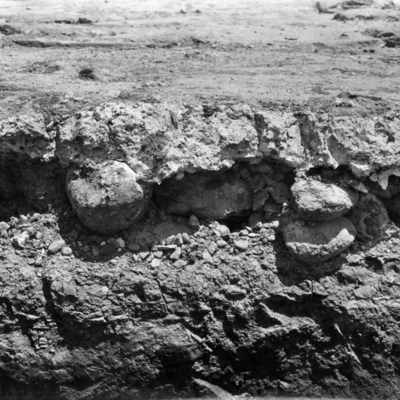 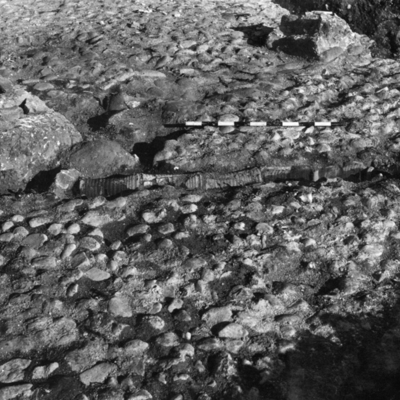 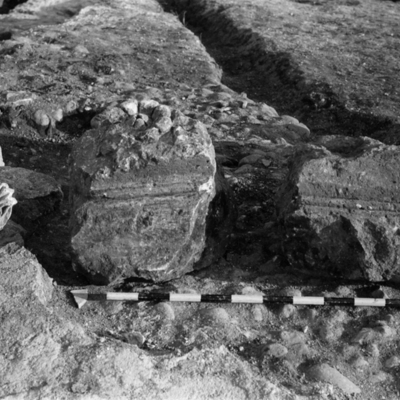 Detail of late water channel with jars in situ. 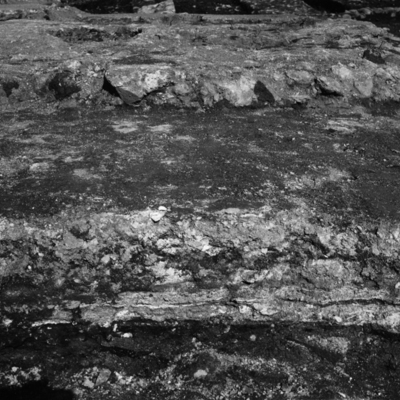 Wall E at southwest corner of Room 7 showing change in thickness. 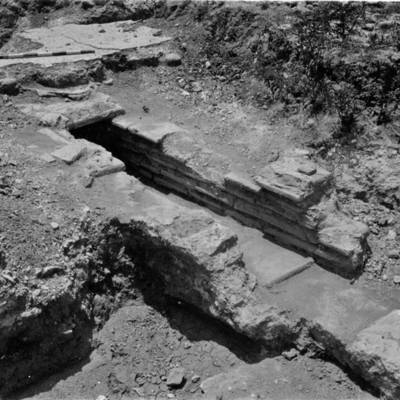 First cross wall west of wall E showing type of construction. 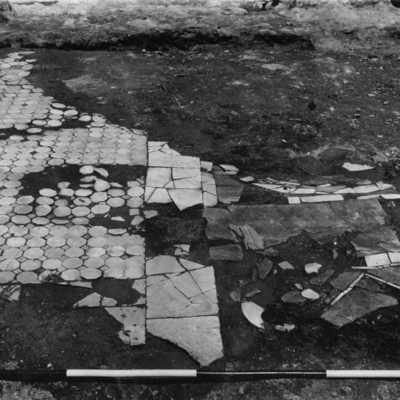 General view across Rooms 4 & 8 showing position of mosaics. 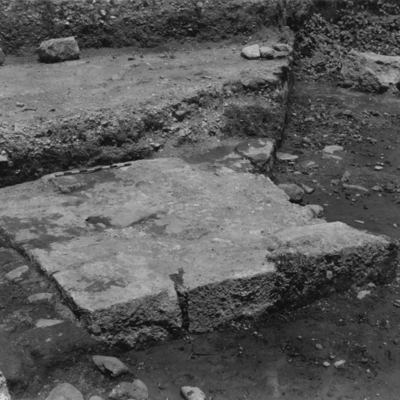 Eastern end of Room 7. 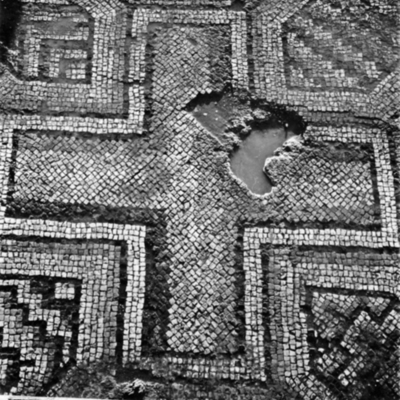 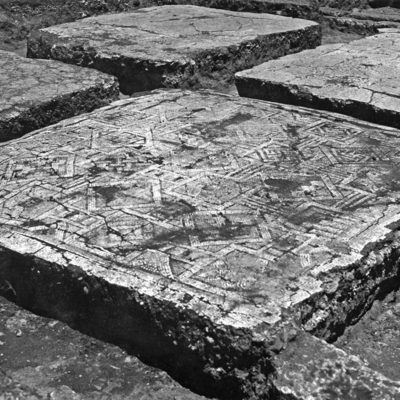 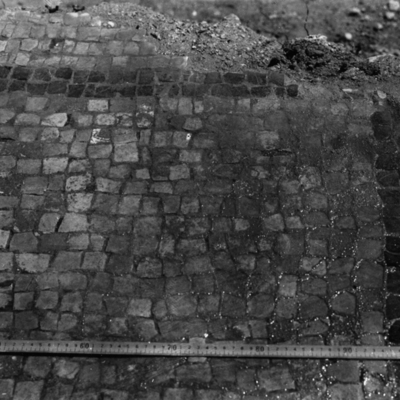 General view of mosaic floor. 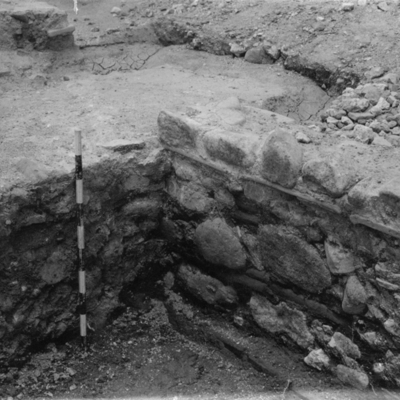 Second cross wall west of wall E showing drain on north face. 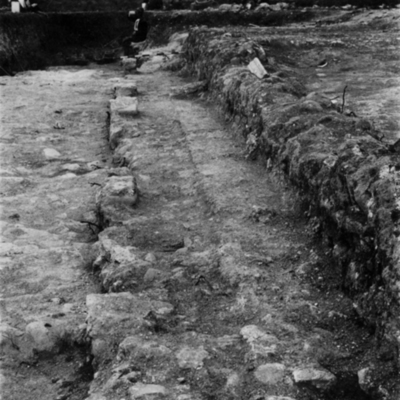 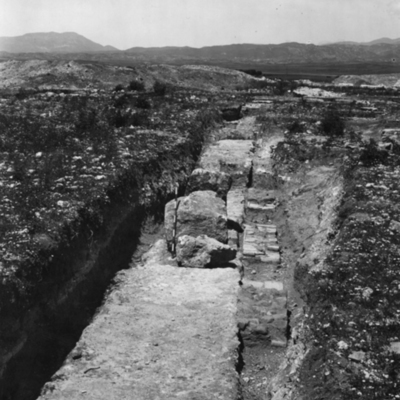 Late water channel showing columns built into sides. 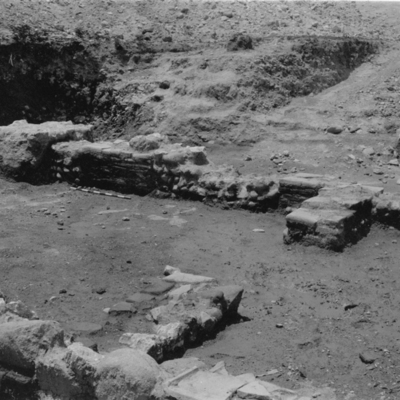 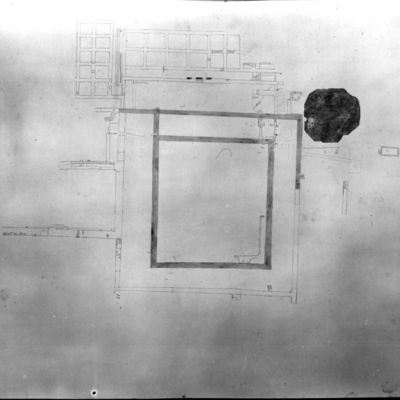 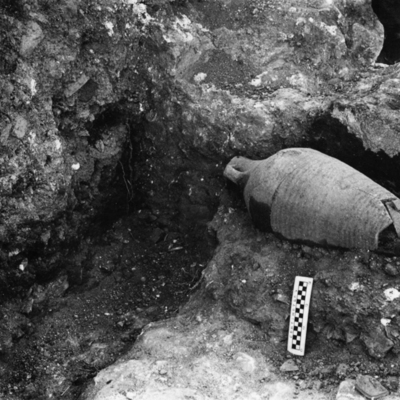 General view of excavations under Room 3. 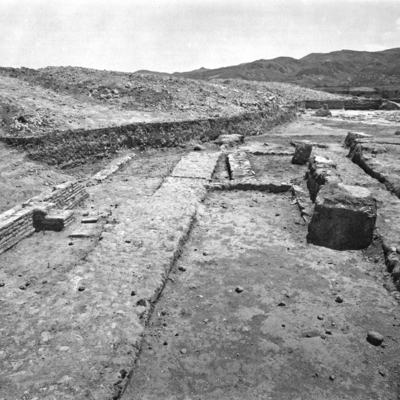 View along wall A showing brick "offsets." 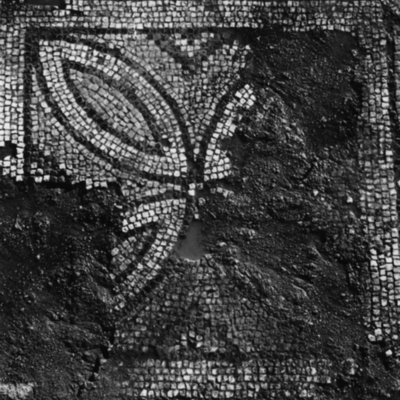 Detail of badly fragmented mosaic panel. 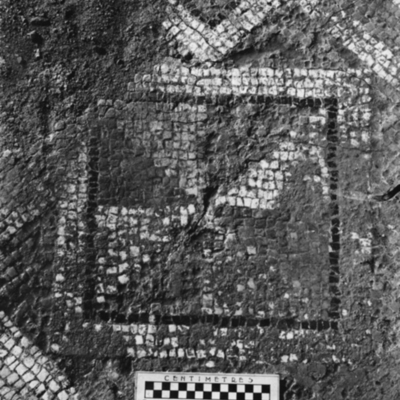 General view with angle of great square in Room 1. 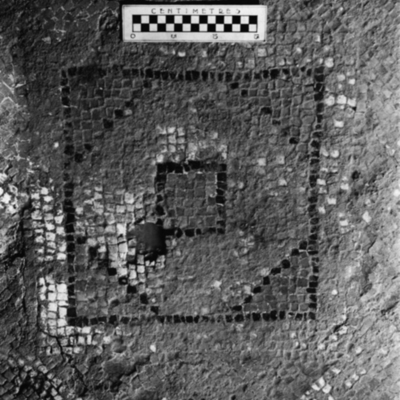 Detail corner of octagon in Room 1. 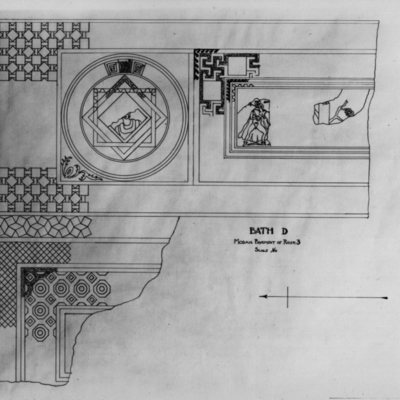 Plan of Bath D Room 3 mosaics. 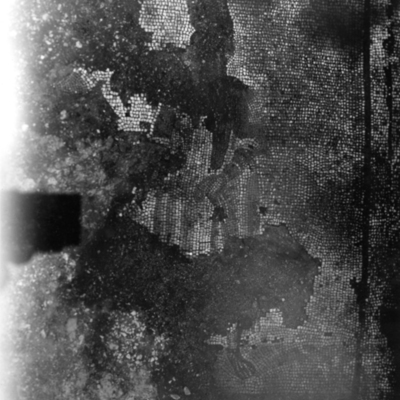 Detail of wall and court. 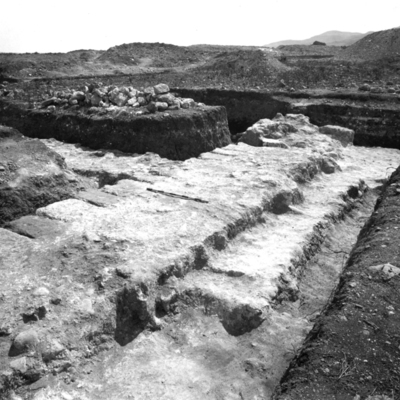 General view of Room 1. 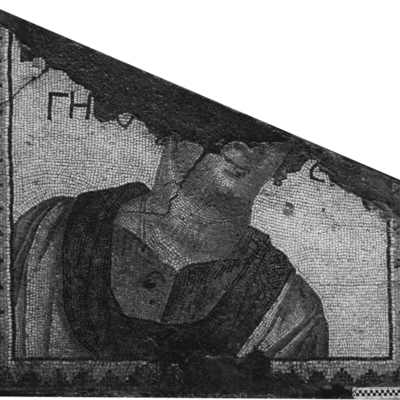 Panel A from Room 3 female head (half-destryoed). 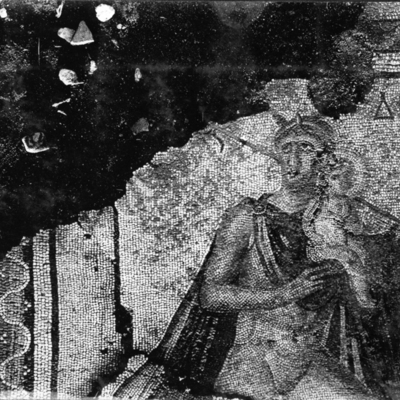 Panel B-2 from Room 3 Mosaic of Hermes and Dionysus. 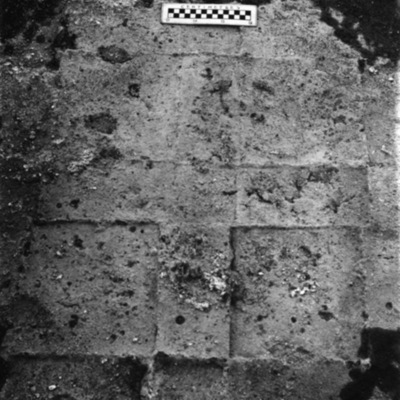 Raised panel section 3 from the border of Room 3. 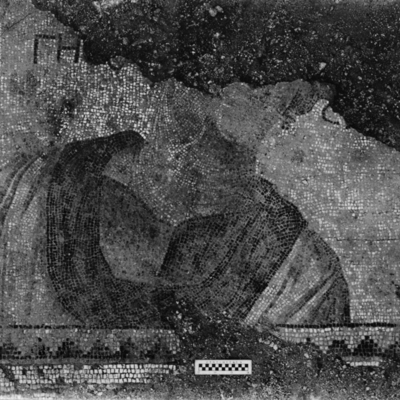 Raised panel from the border of later floor in Room 3. 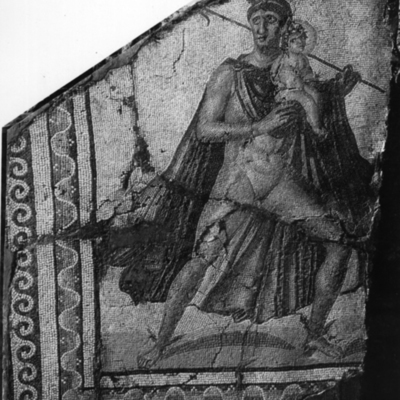 Raised mosaic panel showing Hermes and Dionysus. 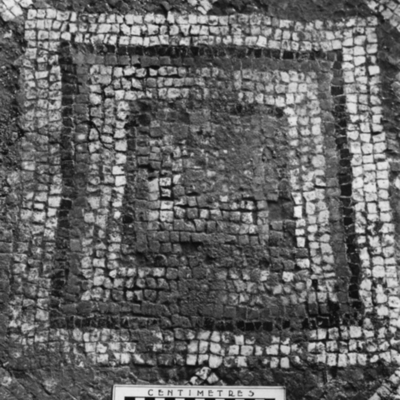 Raised mosaic panel section 4 from Room 3. 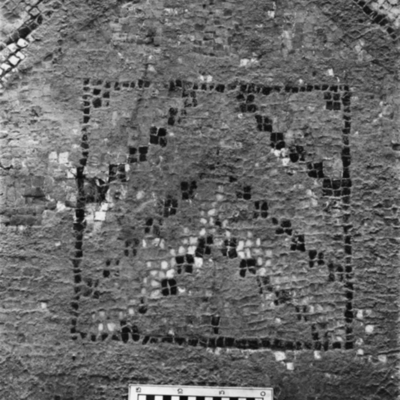 Raised mosaic panel section 1 from panel A in Room 3. 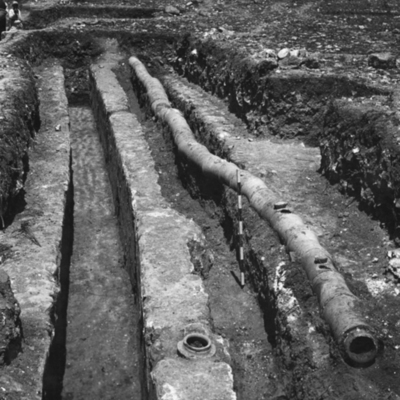 Large lead water pipe. 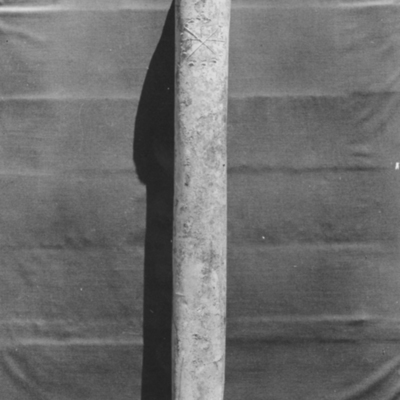 Found in 1933. 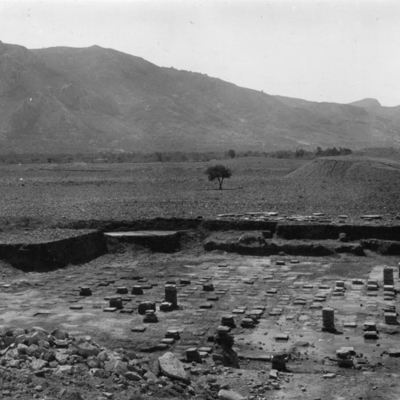 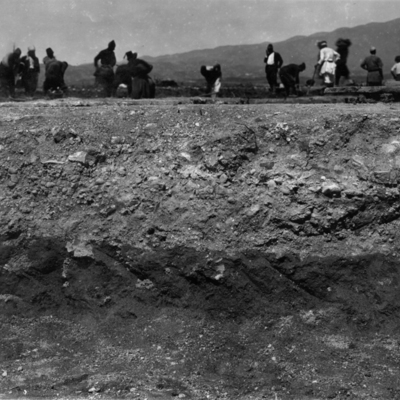 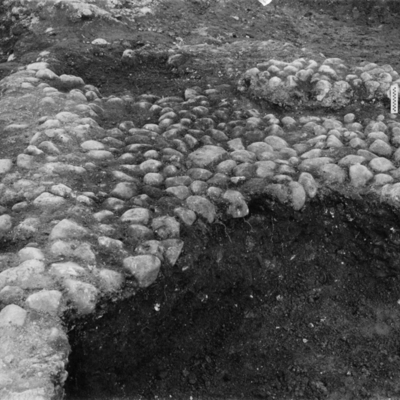 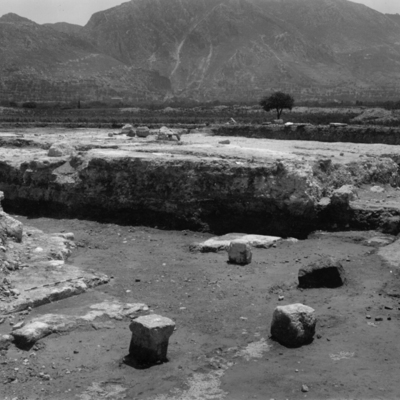 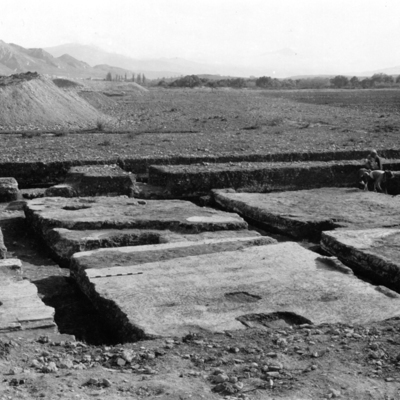 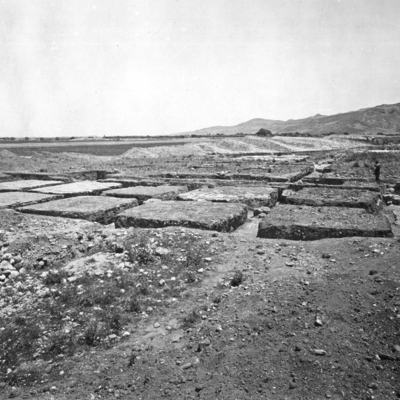 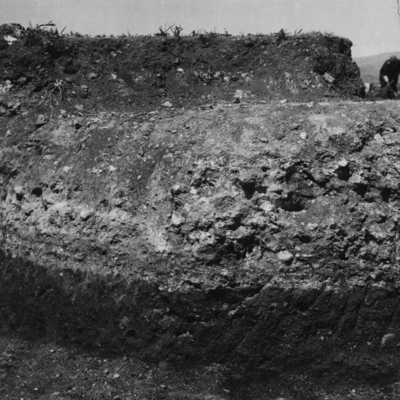 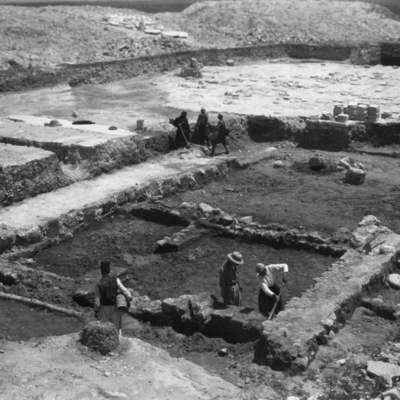 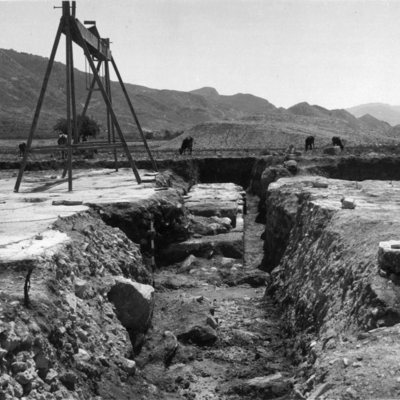 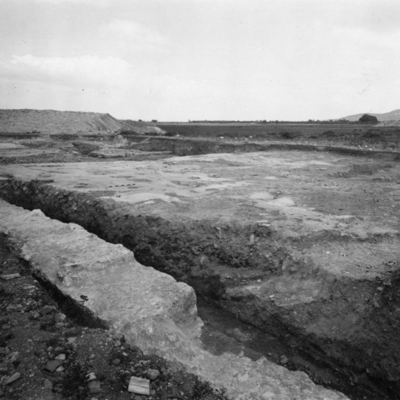 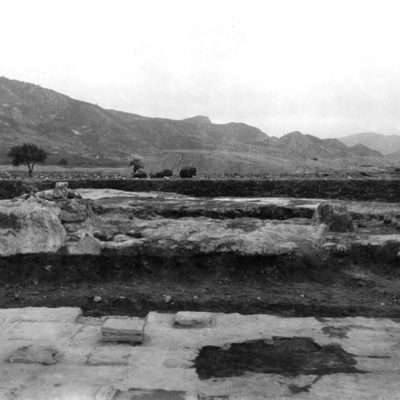 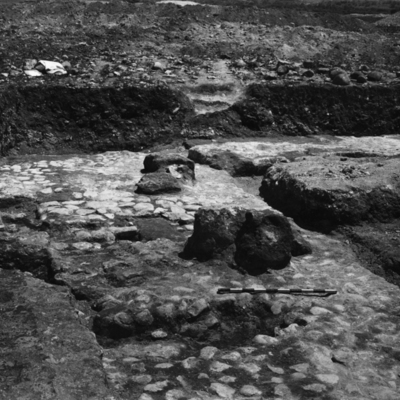 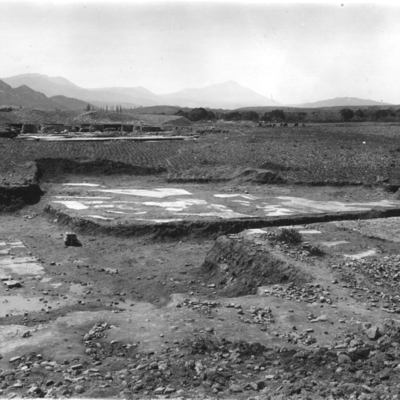 General view of excavations with Bath C in background. 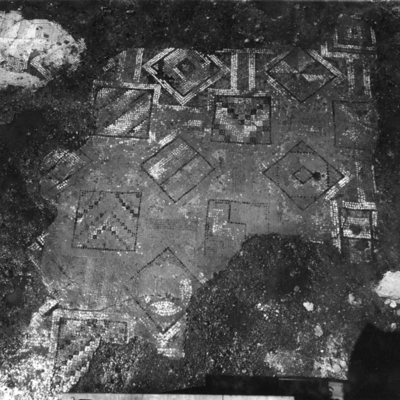 North border of panel B-1. 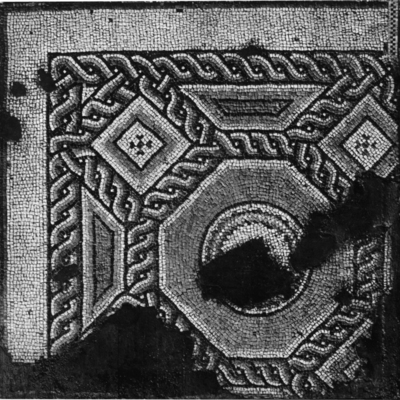 Inner border of panel A.
Floral design from corner of square. 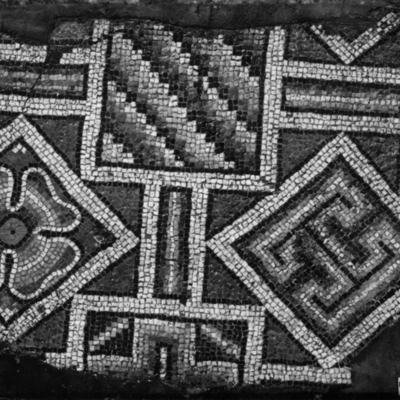 Close-up of tesserae in border. 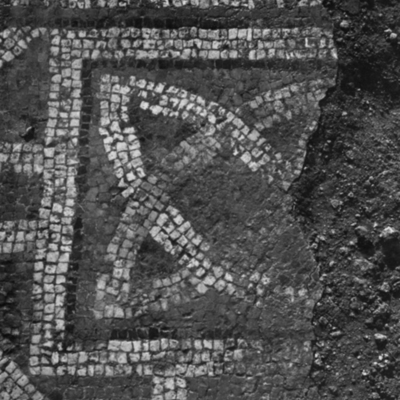 Detail of border on circle. 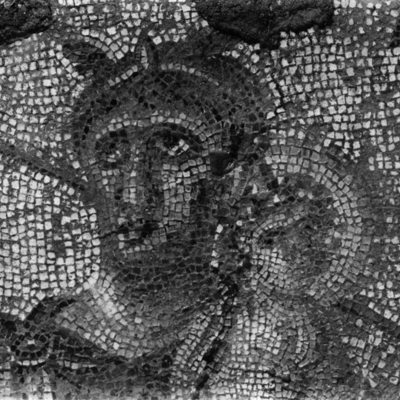 Upper half of Hermes figure with inscription DION. 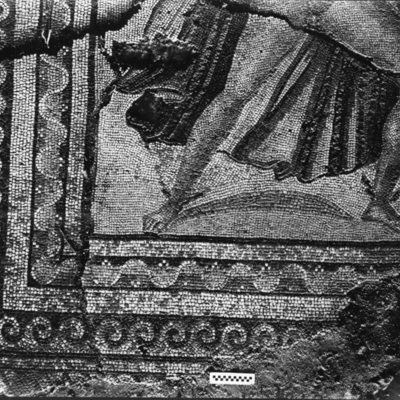 Lower half of Hermes figure with inscription DION. 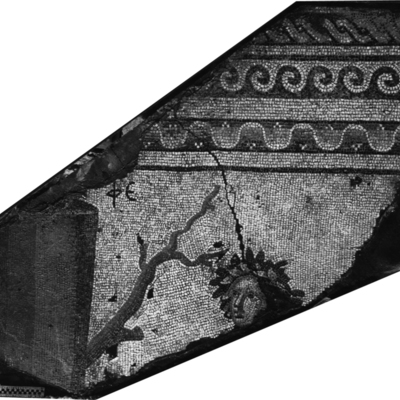 Fragment with head of a Nymph. 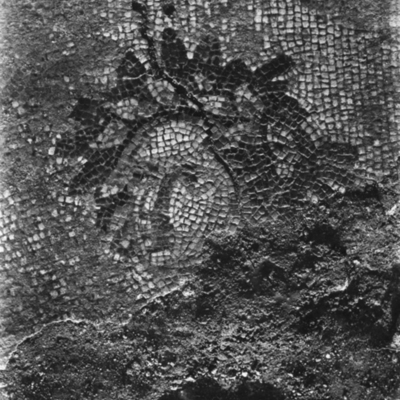 Detail of heads of Hermes and Dionysus. 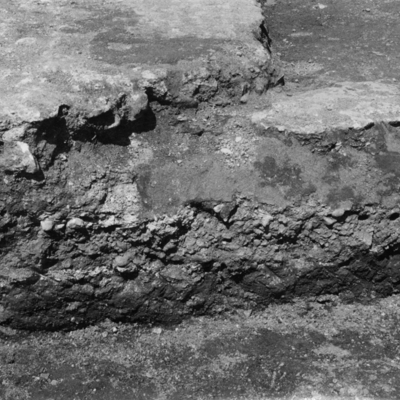 Block of cornice found in trench to Bath C.
Detail of pavement to west of room. 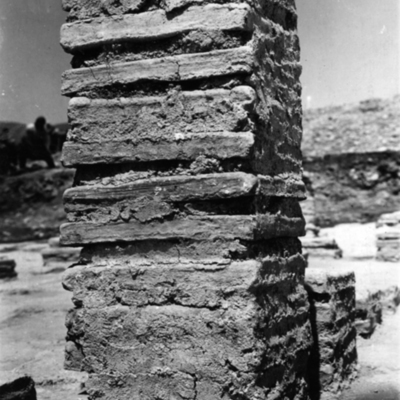 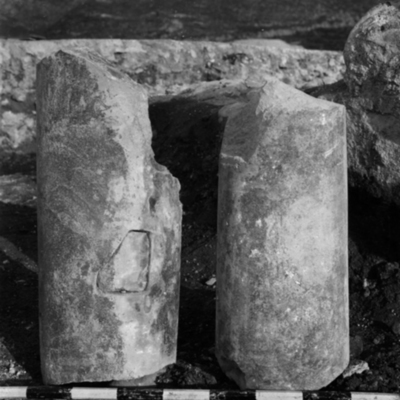 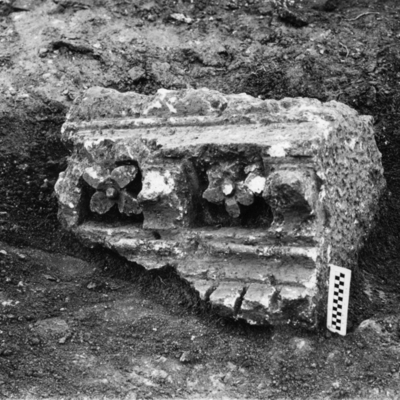 Detail of hypocaust column showing mortar joint. 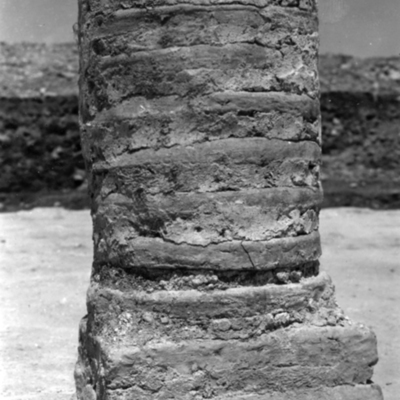 Detail of round hypocaust column. 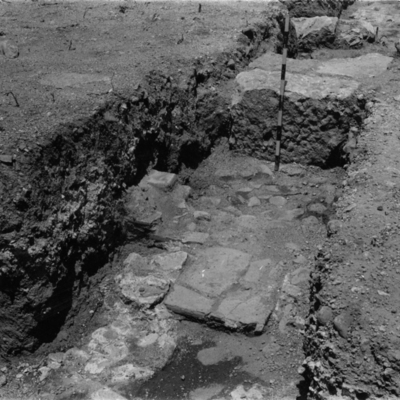 Edge of hypocaust room and late floor to the south. 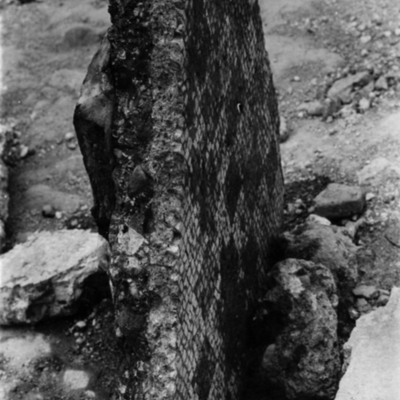 Female figure in inscribed square and inscription fragment. 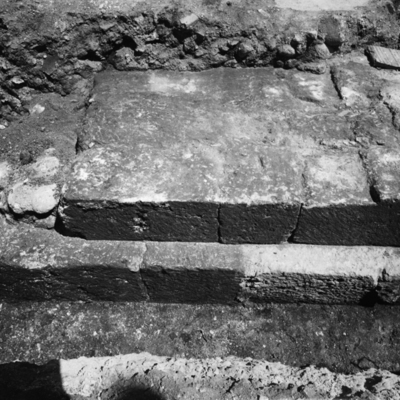 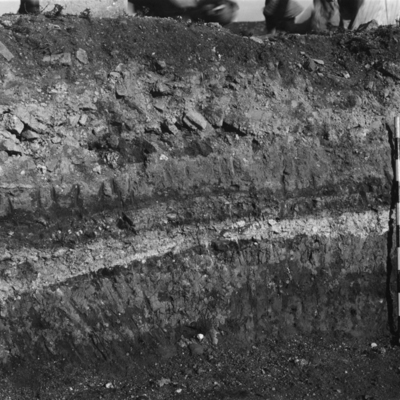 Detail of stratification east of Room 1. 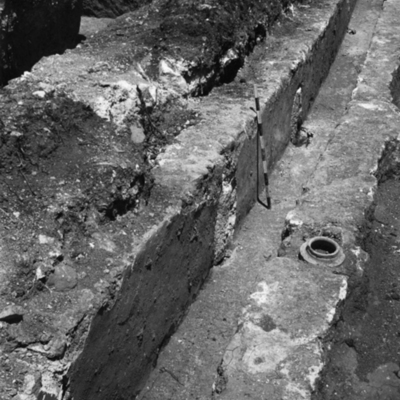 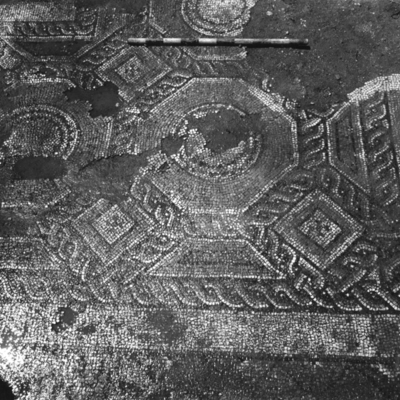 Detail of drain cut through floor. 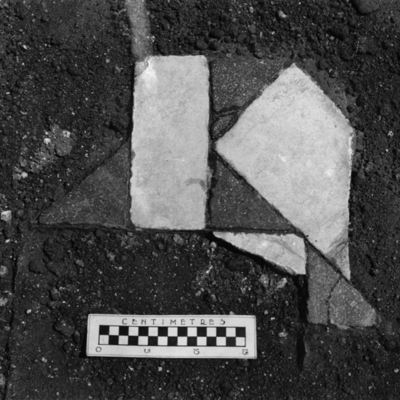 Fragmented architectural marble between Rooms 4 & 5. 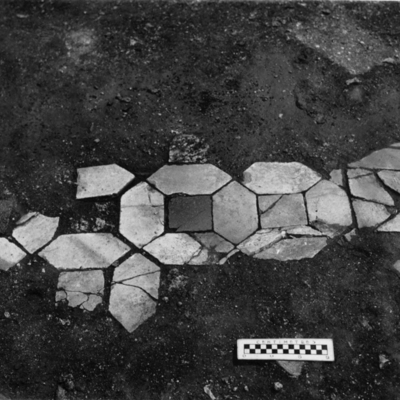 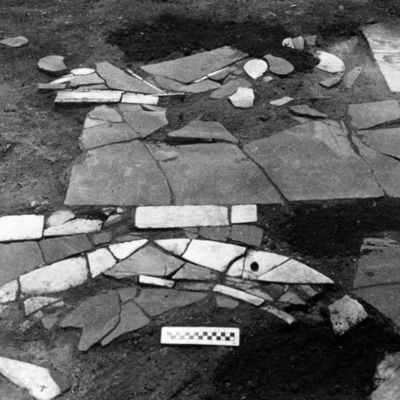 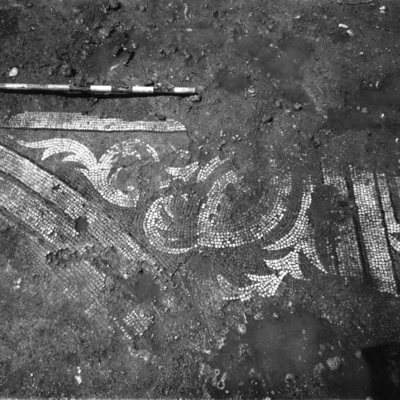 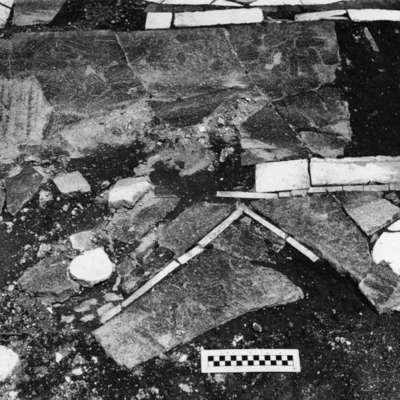 Tile debris and incense burner in situ over mosaic floor. 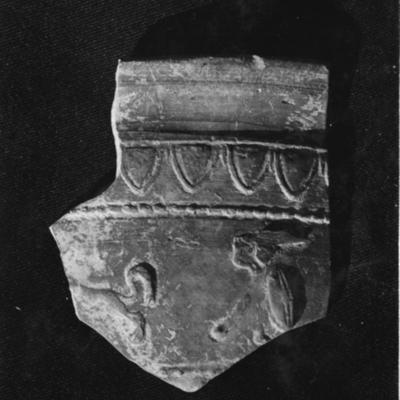 Red ware sherd with hunting scene.